Second must do tour for first time visitors in Florence. You walk past the homes of Leonardo da Vinci and Michelangelo to the gothic church, Santa Croce. Here you visit the tombs of Michelangelo, Galileo and Machiavelli and marvel at the art works of Donatello and Giotto. It is a short walk to the town hall at Piazza della Signoria. This is the center of Florentine politics and home to a captivating outdoor sculpture gallery. 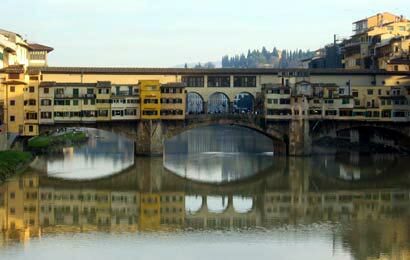 Shopping, architecture and history collide in your mind as you stroll over the Ponte Vecchio. The day culminates at the Uffizi Gallery, where you concentrate on selected masterpieces of Giotto, Botticelli, Raphael, da Vinci and Michelangelo. Your Lecture-Guide, with pre-booked tickets in hand, weaves you through the inspirational, impressive and intoxicating beauty of the Florentine Center. Tour can easily be combined with Florence Part One Tour on the the same day.